When you incorporate your business, you take on new responsibilities. One of these is filing Form 1120 (U.S. Corporate Income Tax Return)—five pages of dense text and empty, numbered boxes demanding to be filled. Don’t let the fine print get you down. With a little preparation, Form 1120 is easily vanquished. Let’s look at who needs to file Form 1120, how to file it, and what business records you’ll need to have on hand to get the job done. 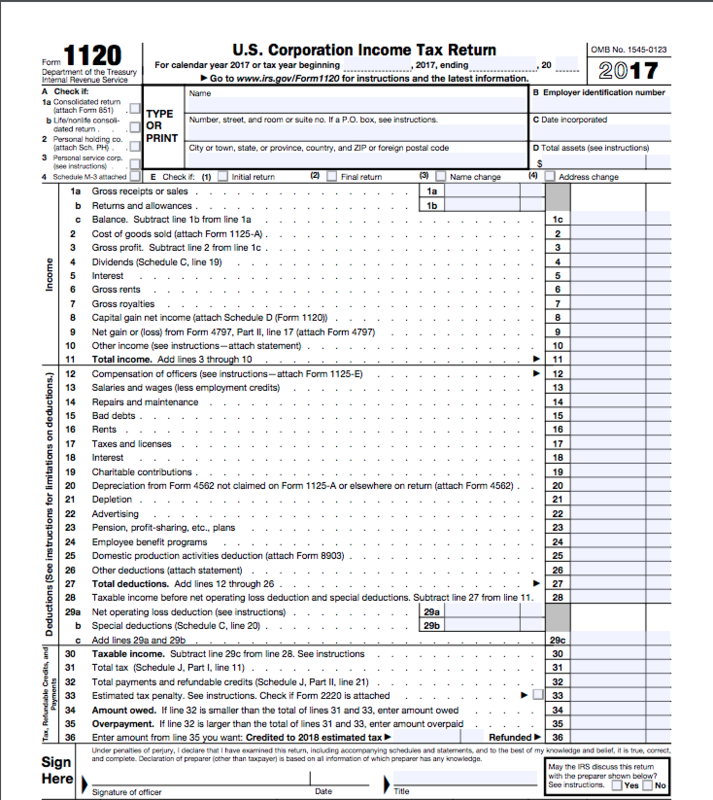 Form 1120 is the tax form C corporations (and LLCs filing as corporations) use to file their income taxes. Once you’ve completed Form 1120, you should have an idea of how much your corporation needs to pay in taxes. But that money doesn’t go to the IRS all in one lump sum; every corporation is required to pay quarterly estimated taxes. Whether you’re filing Form 1120 yourself, or your accountant is taking care of it, here’s a checklist of the information you should have on hand so you can complete and file the form. You have the option to file Form 1120 either online or by mail. Because it’s faster, easier, and cuts back on paperwork, we always recommend filing online using the IRS efile service. Plus, some large C corporations reporting $10 million or more in assets are required to file online. Find out whether your C corporation has to file online. The deadline for filing Form 1120 for the 2018 financial year is April 15, 2019.